StaMixCo manufactures a wide variety of plastic disposable and metal static mixers for 2-component resin system applications. We fabricate both the industry standard Medium Performance Helical Static mixer and High Performance X-Grid static mixers for difficult applications. The High Performance Plastic Disposable GXF static mixer is an X-Grid design capable of creating high degrees of mixing in a short length. It is capable of mixing fluids with large differences is viscosity and volumetric ratios. 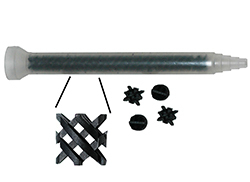 Complete units with bell connection and stepped tip are standard in polypropylene construction throughout. Individual mixing elements are also available for customers who desire to install in their metal tubing or plastic housings. GXF units are standard stock items with shipment next day after purchase. The High Performance Plastic Disposable GXP static mixer is an X-Grid design capable of creating high degrees of mixing in a short length. It is capable of mixing fluids with large differences is viscosity and volumetric ratios. 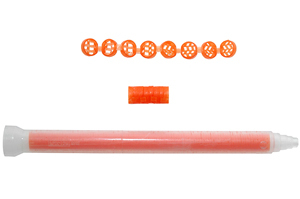 Complete units with bell connection and stepped tip are standard in polypropylene construction throughout. Individual mixing elements are also available for customers who desire to install in their metal tubing or plastic housings. GXP units are standard stock items with shipment next day after purchase. The High Performance Plastic Disposable GXR-P static mixer is an X-Grid design capable of creating high degrees of mixing in a short length. It is capable of mixing fluids with large differences is viscosity and volumetric ratios. The large ID=21 mm (0.83”) mixing element is capable of processing large flow rates and fits into standard metal tubing with Swagelok® compression fitting end connections. The mixing elements are standard stock items with shipment next day after purchase. 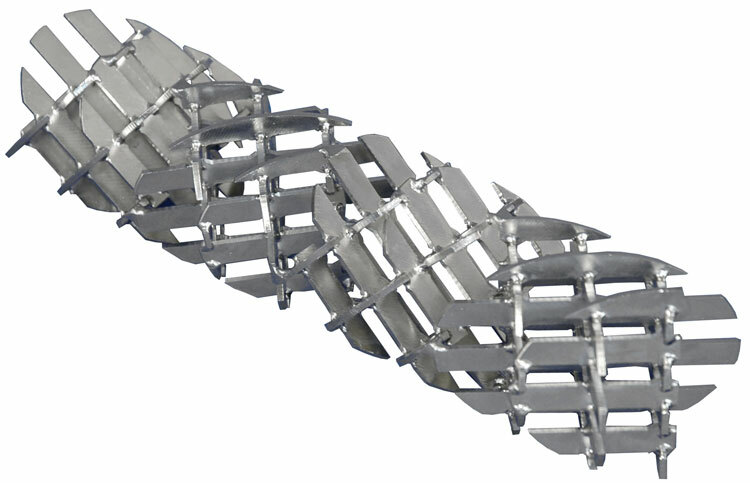 The High Performance Metal GX static mixer is an X-Grid design capable of creating high degrees of mixing in a short length. It is capable of mixing fluids with large differences is viscosity and volumetric ratios. 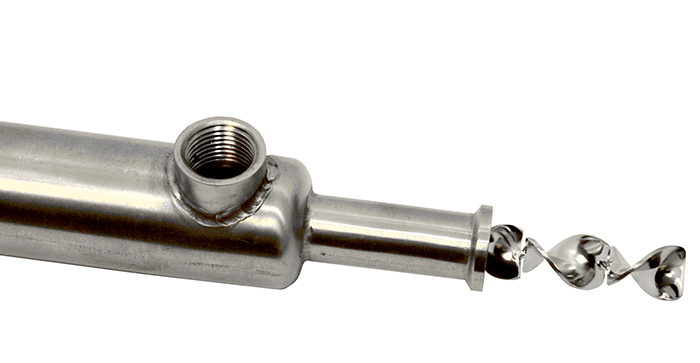 Complete units are available in metal pipe or tubing with threaded, flanged or sanitary Ferrule connections, Mixing elements only are available in 316L S/S construction with shipment next day after purchase. 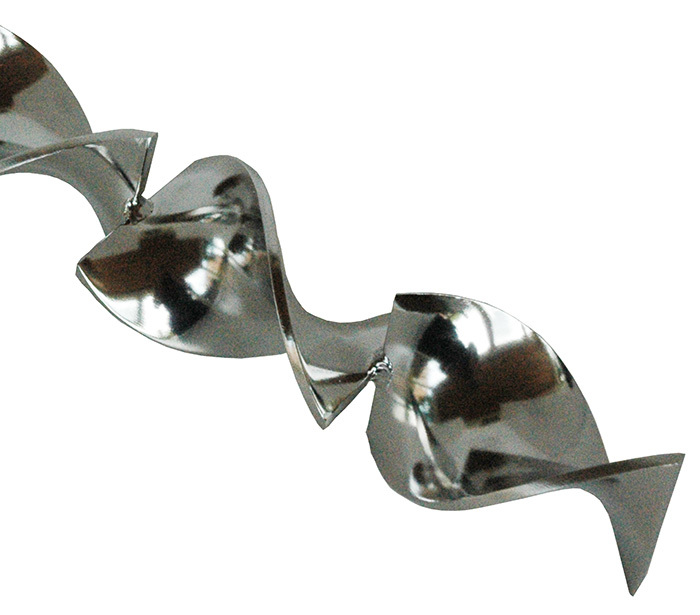 The High Performance GXR static mixer is an X-Grid design capable of creating high degrees of mixing in a short length. It is capable of mixing fluids with large differences is viscosity and volumetric ratios. Complete units are available with machined housings and threaded or flanged end connections. Because of the support ring around the mixing element structure, the mixing elements can easily be safely pushed out of the housing for cleaning and reuse with many years of trouble free repeat service. GXR units are standard stock items with shipment next day after purchase. 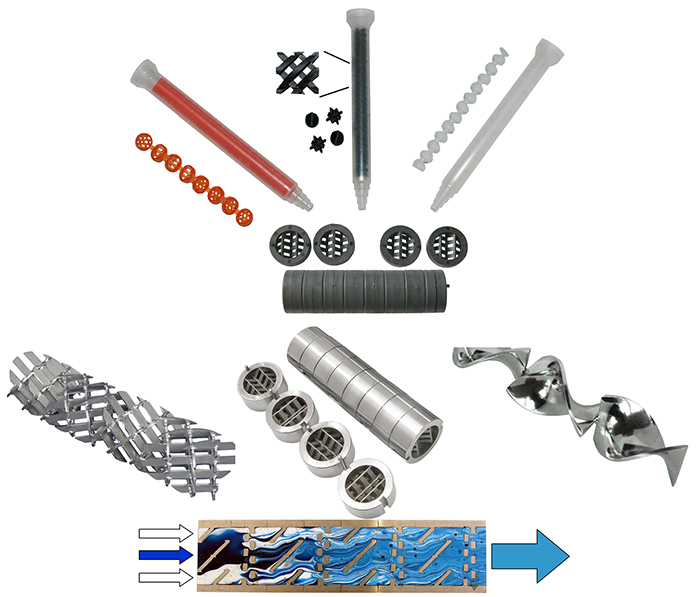 The Medium Performance helical static mixing element assembly is capable of mixing materials with modest differences in viscosity and volumetric ratio. They are available in many diameters as small as OD=1.7 mm (0.067”) - 3” diameter in various plastic materials such as Acetal, Polypropylene, Kynar, PTFE, PVC, etc. 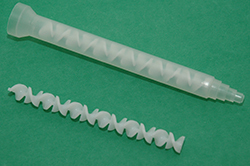 Most of the plastic mixing elements are standard stock items with shipment next day after purchase. Complete units with mixing elements and housings of various designs are described below. The Model HT-10 unit consist of Medium Performance helical static mixing elements in Acetal construction mounted in a Polypropylene housing with bell, bayonet of threaded connection and a discharge tip that is stepped, with a Luer fitting or a threaded connection. Most units are standard stock items with shipment next day after purchase. 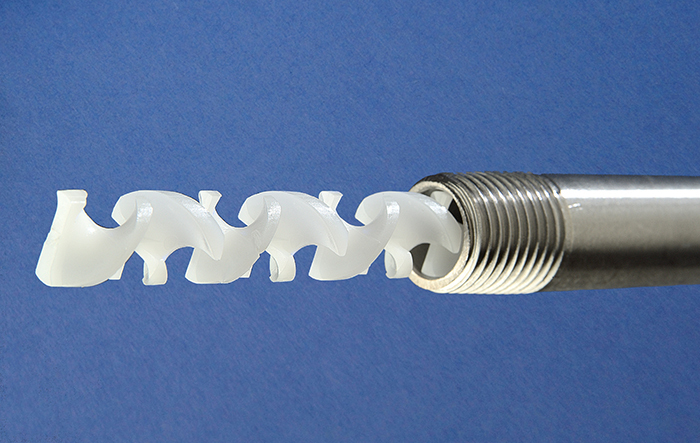 The Model HT-11 unit consist of Medium Performance helical static mixing elements in Acetal construction mounted in a high pressure Nylon housing with brass NPT threaded end connections. 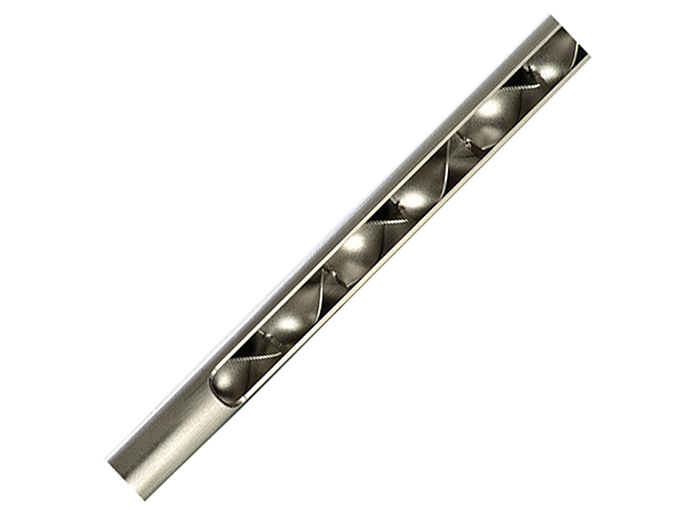 They are available in many diameters and length where most sizes are standard stock items with shipment next day after purchase. The Model HT-30 consists of Medium Performance helical static mixing elements in Acetal or Polypropylene construction mounted in a honed Sch. 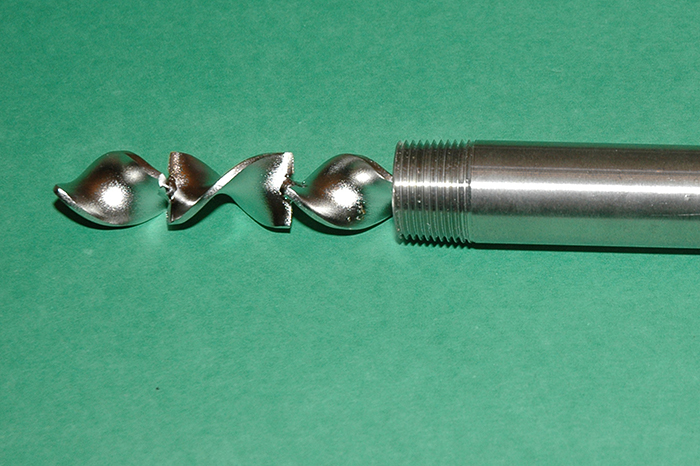 40 pipe with threaded ends for use in applications operating at high pressure. They are available in many diameters and length. Most sizes are standard stock items with shipment next day after purchase. The Medium Performance helical static mixing element assembly is available in 316L S/S and other exotic materials of construction to fit standard pipe and most tubing sizes. Most of the metal mixing elements are standard stock items with shipment next day after purchase. Complete units with mixing elements and housings of various designs are described below. The Model HT-20 Medium Performance helical static mixing unit is available with 316L S/S mixing elements mounted in a 304 S/S Sch. 40 pipe housing with NPT threaded ends. Units up to 2” diameter are standard stock items with shipment next day after purchase. The Model HT-22 Medium Performance helical static mixing unit is available in 316 S/S construction where the mixing elements are edge-seal brazed to the tubing wall. They are useful when operating at low flow rates, high pressure drop and high temperatures and somewhat assist in mixing when processing materials with large differences in viscosity. 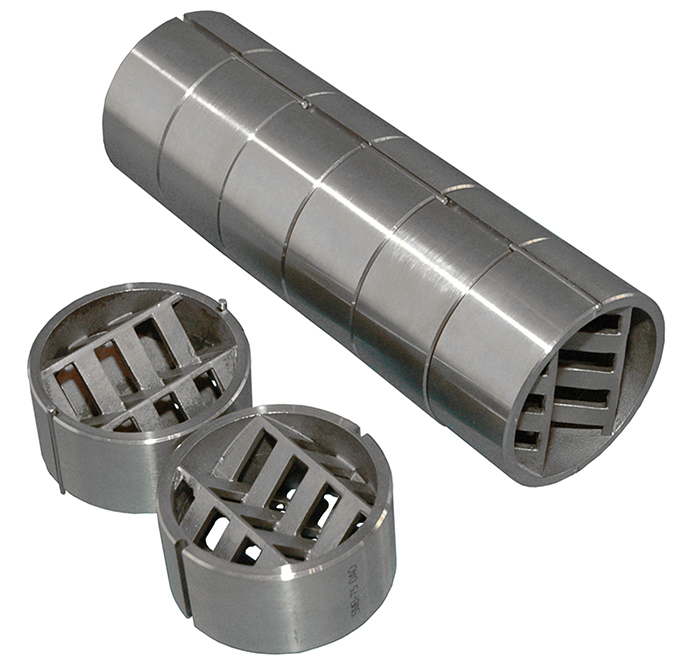 The units are available in tubing sizes of 3/16” to 1/2" diameter with plain ends. Units are standard stock items with shipment next day after purchase. Figure #14: Custom Fabricated Helical Static Mixers are available with cooling jacket, sanitary ferrule end connections for quick assembly and disassembly and polished wetted part surfaces for processing fouling materials. Custom helical static mixing units can be fabricated in virtually any diameter, material of construction, surface finish and with out without cooling/heating jackets.